Cities: Skylines' mod support is so intuitive, it's even gaining the attention of ex-SimCity developers. Update: If you think Bryan "MaxisLime" Shannon deserves some dosh for his work, you can now support him on Patreon. As Shannon is between jobs at the moment, he is looking to try and get some money for his modding, with Patreons paying him out for every building he makes for Cities: Skylines. Original Story: From death, comes life. In the same month that we heard EA Games was closing down SimCity studio Maxis, we were also given Cities: Skylines - a game that well and truly managed to "out-SimCity" the latest SimCity. One of the biggest praises of Skylines was its fantastic mod support, and now, even an ex-SimCity developer from the defunct Maxis studio is giving it a whirl. MaxisLime worked at the Emeryville Maxis studio as an artist, where he contributed assets to SimCity 2013 for about a year and a half. 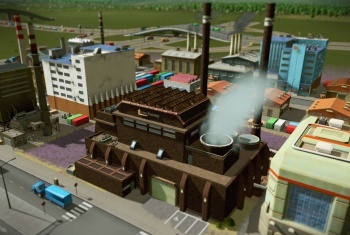 Now, he has turned his talents to Cities: Skylines' mod tools, where he has produced this neat custom coal power plant. "With my mod of the base Coal Power Plant, you will have some slightly increased stats at the cost of minor increased noise pollution and increased construction cost. A custom model was used as well as various custom textures," wrote MaxisLime. "I wanted to bring some dirty bricks in to the overall pastel palette that the game uses. All of the appropriate particles and entryways have been tuned, and size comparison on the grid is the exact same as the original garish and oddly futuristic coal building that shipped with the game." MaxisLime praised the ease-of-use of Cities: Skylines' mod tools, which are being used for impressive feats such as re-creating GTA V's Los Santos with impeccable detail. He says that this is just his first mod of many, and to look forward to more of his work.